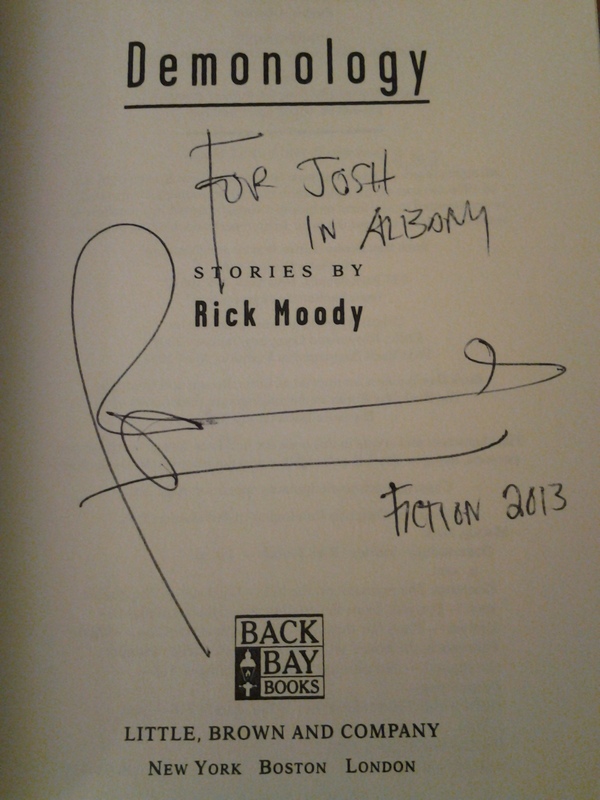 When author Rick Moody (The Ice Storm, Demonology) came to Saint Rose Thursday, September 26th as part of the Frequency North visiting writers series, he did something most guest writers do after they read – offered to sign his books. While I was standing in line behind Professor Dan Nester, waiting to have my copy of Demonology inscribed, I started to wonder what the fascination of autographs really is. Professor Nester had several of Moody’s works in his hands, so I figured he’d be a good person to ask. Moody, a long-time veteran of the visiting writer scene, was gracious when my turn came. He asked how my program was going and took the time to find out what my concentration was (it’s fiction). He’s an author who truly gets the value of speaking to his fans – and that’s another good lesson for myself and for the other student writers in the crowd. Frequency North: The Visiting Writers Series of the College of Saint Rose, continues October 17 at 7:30 p.m., with poet Rigoberto Gonzalez. The reading is held in the Standish Rooms on the second floor of the Events and Athletics Center.